The Grand Hall is on the 2nd floor and will accommodate up to 130 people, the tables in that room are 5' rounds and seat 8, the Grand Hall is carpeted and has a 18'x18' dance floor. 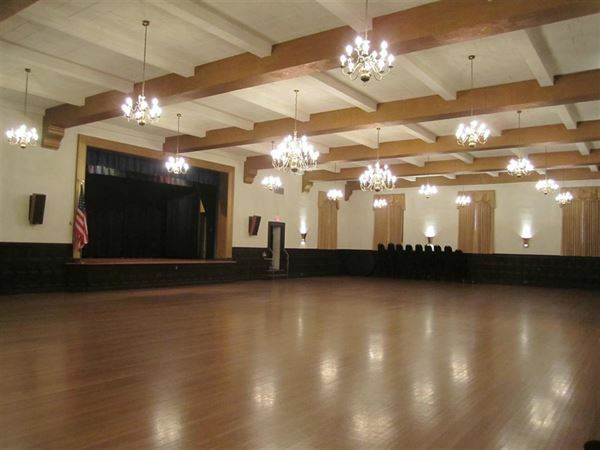 The Grand Hall rental for a Saturday is $2,800 and Friday or Sunday is $2,250. We have a caterer that we recommend or you can bring your own and you or your caterer can bring in alcohol. Also included with the hall rental is the use of our kitchen by your caterer for either food prep and cooking or just keeping food warm prior to serving. We have security personnel on site for every event as well. For most rentals we open the building at 10am for setup and we lockup the facility at 12am (midnight). We do require all rentals to have liability insurance, further info on the insurance requirements can be found on the TULIP link on our web site. If you have any further questions or would like to schedule a tour please feel free to contact me via email or by calling *NOT DISPLAYED* during our office hours Monday - Friday 10am to 4pm. We can also schedule a tour on Thursdays from 4pm-7pm or most Saturdays depending on the rental that day from 10am to 2pm. Our Ballroom will accommodate up to 292 people. We provide and setup the tables and chairs, our tables are 5'x6' oval and seat 10 people at each. The ballroom rental for a Saturday is $4,000 and Friday or Sunday is $3,000. If you want to have both the ceremony and reception here you can have the ceremony in the Grand Hall for an additional $500. We have a caterer that we recommend or you can bring your own and you or your caterer can bring in alcohol. Also included with the hall rental is the use of our kitchen by your caterer for either food prep and cooking or just keeping food warm prior to serving. We have security personnel on site for every event as well. For most rentals we open the building at 10am for setup and we lockup the facility at 12am (midnight). We do require all rentals to have liability insurance, further info on the insurance requirements can be found on the TULIP link on our web site. If you have any further questions or would like to schedule a tour please feel free to contact me via email or by calling *NOT DISPLAYED* during our office hours Monday - Friday 10am to 4pm. We can also schedule a tour on Thursdays from 4pm-7pm or most Saturdays depending on the rental that day from 10am to 2pm.